Cryptocurrencies have attracted a lot of attention from speculative investors because of the promise blockchain technology offers for revolutionizing a variety of industries. But for all crypto projects, the ultimate goal is adoption, and that’s particularly urgent for crypto assets — the crypto tokens that are designed primarily to be used for financial transactions and/or to store value. So how will crypto assets fit into our daily lives, if they ever do? And how close are they to reaching important adoption benchmarks? This article will delve into publicly available adoption patterns that we name “Fundamental Adoption Drivers” for four cryptocurrencies: Bitcoin, Dash, Monero, and Zcash. For each, we’ll zero in on three key areas — blockchain, ecosystem, and Github — and assess adoption rates for each coin over the past 6 months. When searching for fundamental adoption drivers of a cryptocurrency, it is imperative to assess the underlying foundation of the asset. In crypto assets, regardless of where an asset is in its development, data related to both the supply- and demand-side of a native blockchain illustrate a key set of fundamental drivers. In this section we focus on the demand side fundamentals such as the number of transactions, the average transaction value, transaction volume, and the number of addresses. Monero and Zcash are both privacy crypto assets; however, anonymous or private transactions are optional and minimally used in the Zcash network for technical reason. In Monero, though, transaction value and the number of transactions are obfuscated and thus missing in our analysis. Our dataset can be found here. It should come as no surprise that Bitcoin, the oldest of these crypto assets, leads the pack in terms of transaction volume. And it’s worth noting that Bitcoin has a positive growth rate of 2.13% over the last six months. Dash, launched in 2014, is ahead of Zcash (2016), but both recorded a negative growth of -4.99% and — 13.85% respectively in the sampled period of six months. Note that due to a stress test experiment, Dash reached a six-month all time high of 41,128 transactions on average in July 2018. 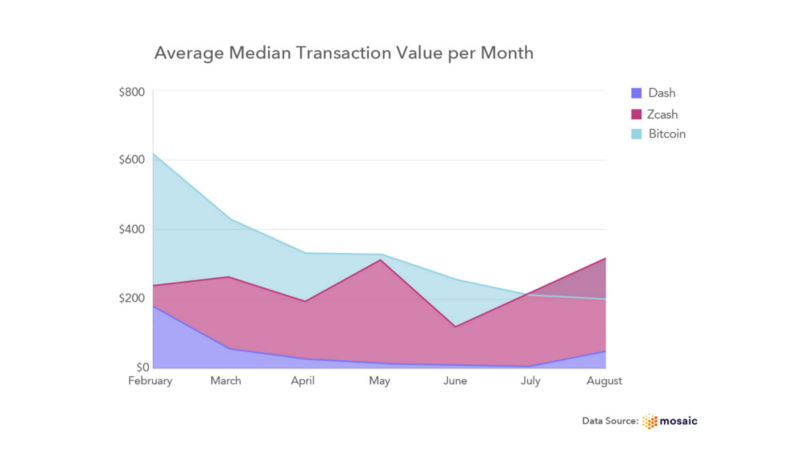 At first glance when looking at the daily median transaction value averaged on a monthly basis, each coin follows a similar adoption pattern over the sampled period of six months. However, Zcash in particular experienced the highest growth rate of 4.89% over this period. Indeed, in July 2018, the median transaction value of ZEC surpassed Bitcoin, which experienced a negative growth rate of -17.28% during the same period. Again unsurprisingly, Bitcoin holds the largest market share in terms of transaction volume relative to the other three coins. Although the other coins are at different points in their development cycles, their level of adoption under this proxy illustrates the total scale of their adoption. Monero (the best performer of the group) experienced the highest level of adoption in this period with a growth rate of -1.24% while Dash (the worst performer of the group) experienced the lowest level of adoption in this period with a growth rate of -24.83%. 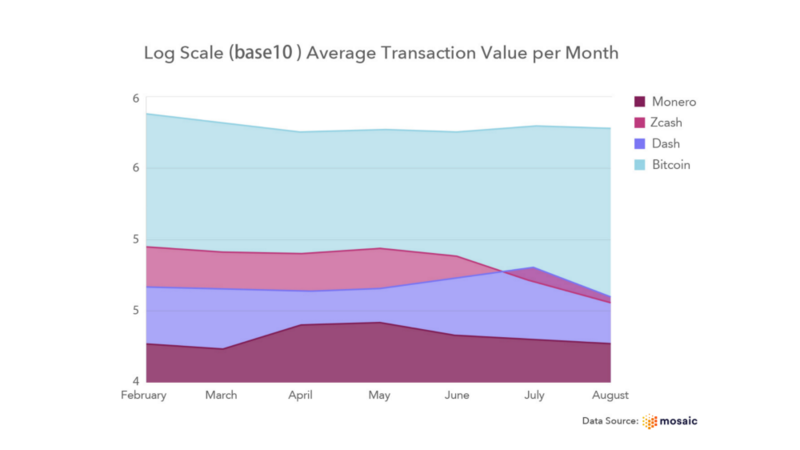 The significant drop in transaction volume in Dash is marked and justified by the transition from the stress-test level of more than 40,000 transactions in July to regular levels of about 5,000 transactions in August 2018. 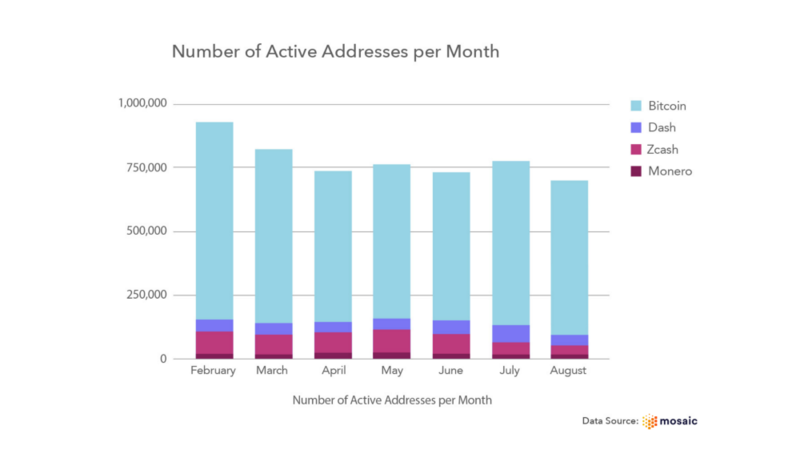 In terms of unique active addresses per month, Monero had the highest growth rate over the last six months, with 0.14% growth. 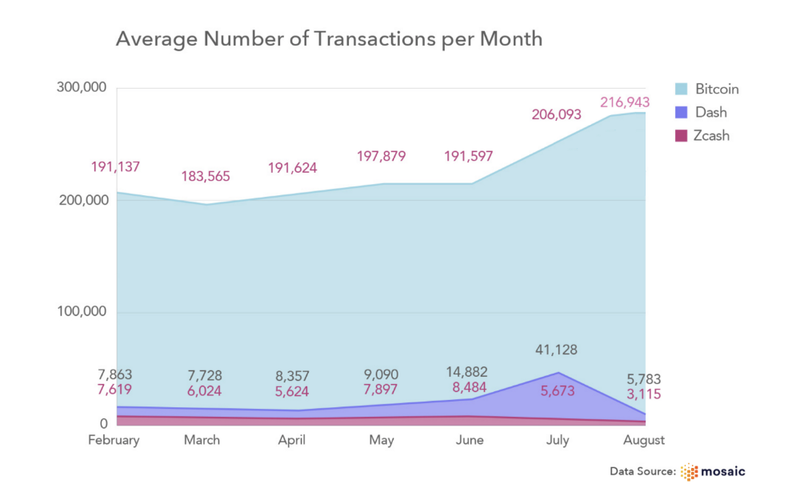 But it also had the lowest number of recorded active addresses, with on average just 18,644 addresses making transactions in August, 2018, compared to the 612,401 recorded on the Bitcoin blockchain. Zcash had the lowest growth rate (-14.34%) over the past six months. Why the sharp decline for Zcash? Bitcoin’s dominance increases during bear markets, forcing the flow of funds from secondary crypto assets like Zcash to revert back to Bitcoin. Also to blame for Zcash’s weak showing: negative sentimentfrom market participants. Of course, when measuring a cryptocurrency’s overall adoption, we can’t just look at blockchain transactions. 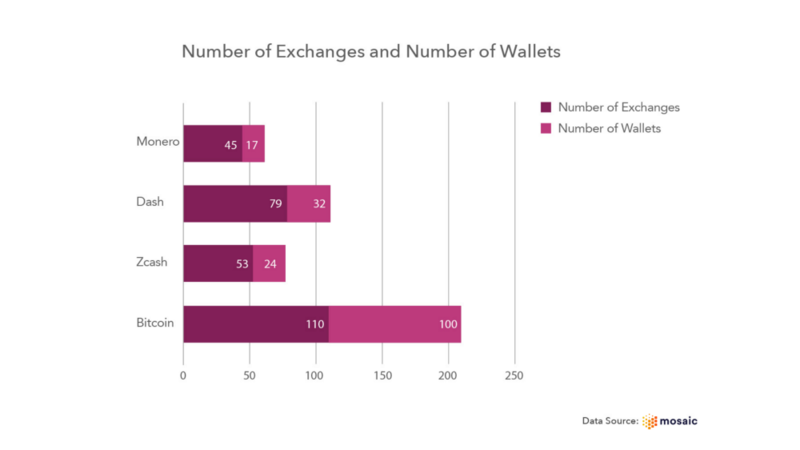 We also need to attempt to measure its broader ecosystem by looking at factors like the number of exchanges that list a coin and the number of wallets that support it. This data highlights a coin’s potential level of exposure to end-users. However, the lack of publicly available data on exchanges and wallets makes these challenging metrics to rely on in order to accurately evaluate the level of a coin’s adoption. Unsurprisingly, we estimate that Bitcoin is the most supported coin with 110 exchanges and 100 wallets; however Monero is lagging behind with only 45 exchanges and 17 wallets. For the rest, 79 exchanges and 32 wallets support Dash while 53 exchanges and 24 wallets have included Zcash. Comparing crypto assets is tough, because all cryptocurrencies are at different points along their development cycles. When assessing data pertaining to development, we can attempt to gauge how far along a coin is and determine whether or not comparing two assets against each other actually makes sense. It is expected that Bitcoin will have the greatest number of commits relative to the other three coins since it is the oldest and the furthest along in its development. 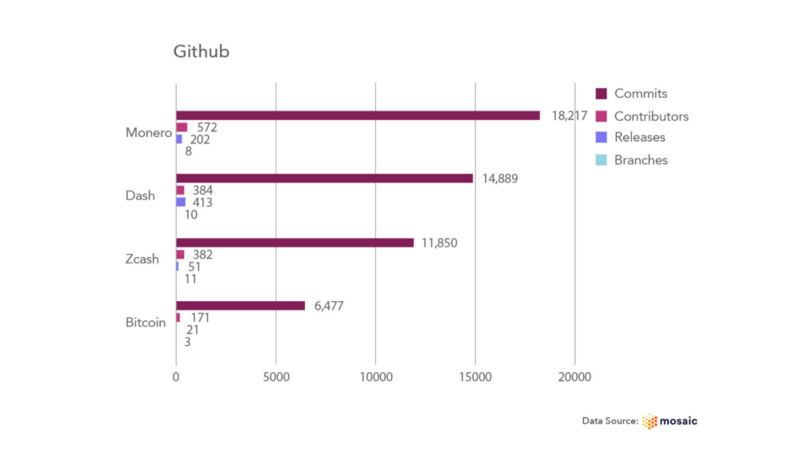 Dash came into existence in 2014; however, it is interesting to note that the number of commits for the project are relatively high when compared to Bitcoin and Monero, which also came into existence in 2014. While cryptocurrencies are complex systems that lack coherent valuation methodologies, there are many ways to quantify and assess the level of adoption for given crypto coin. We believe that measuring and analyzing fundamental factors pertaining to adoption are the most important starting points when attempting to look under the hood of a cryptocurrency, and we encourage all users and market participants to investigate adoption when assessing any crypto asset.